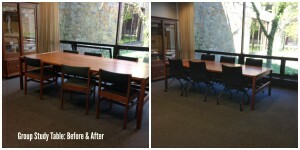 This was my first year to manage a library budget completely on my own. I had a relatively healthy budget (you can always use more, right? :)) but at the same time, I knew that I had a ton of work to do to bring the library up to speed–new website, databases to add, purchasing EZProxy, Libguides, and oh yes, books! We needed print, eBooks, $1,000 in textbooks to complete the reserve collection, not to mention replacing a scarily amazing VHS collection with DVDs. I was like a first timer on safari, treading through tall grass…looking about wildly with each PO I filed and Visa bill that arrived, just waiting for May to come and some tiger…I mean, some annual renewal fee to jump out and bite me. 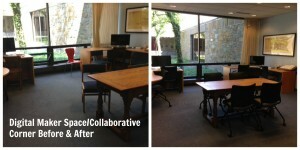 Before the July 1 deadline, I decided to make some high impact physical changes to get my students’ attention, to improve the ambiance and technological usability of the library, and quite honestly, to attempt to set us apart even more so from other student lounge/study areas around campus to improve marketability. 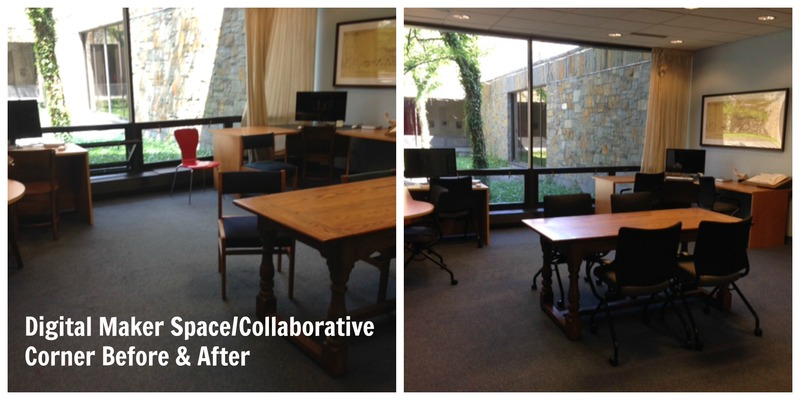 Since I began last August, I have done an inward cringe each morning when I walked in to see all the mismatched chairs and furniture. It felt like my college apartment, like a garage sale treasure hunt gone horribly, horribly wrong. 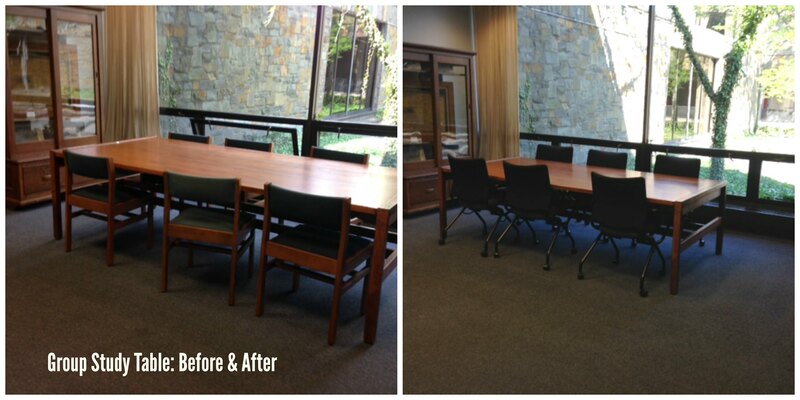 Thankfully, I had enough budget to swing for new chairs. I went for the super comfy Hon chair with arms that flow down for easy push up to tables of varying heights and seats that flip up like auditorium seats for easy stacking away if/when the library hosts events and needs to be more open. Cost for 33 chairs, 4 bar stools, and unbelievably expensive delivery and installation along with lifetime warranty: $8900. I ordered 4 bar stool versions of the chairs to be used at our Research bar. 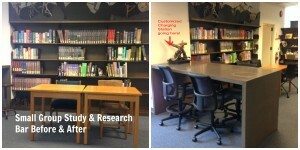 I’m hoping to house the student tech support group this year and will give them a desk right behind the research bar. *Note, the research bar is just a high table in the reference section where kids can bring laptops to do work. We’re also adding a customized wall mounted charging station by the research bar so that students can charge while they study. Cost: $400. How to add power to a 1960’s building without everyone falling over power strip cords? 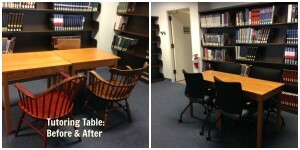 Retrofit existing tables with outlets/ports. I am lucky enough to have an amazingly tech savvy department chair who has a PhD in Civil Engineering…she is going to bring a saw and is going to retrofit the two round tables in the periodical corner with outlets and charging stations. Most facilities departments have an electrical specialist–this person could do this. Each table will have one cord that goes to the wall with a plastic strip covering to avoid trips. Total cost $850. Disclaimer: notice that I said “Gap budget” and not “Old Navy”, or better yet, “Goodwill”–how good would that be for the wallet and for the alliteration factor? 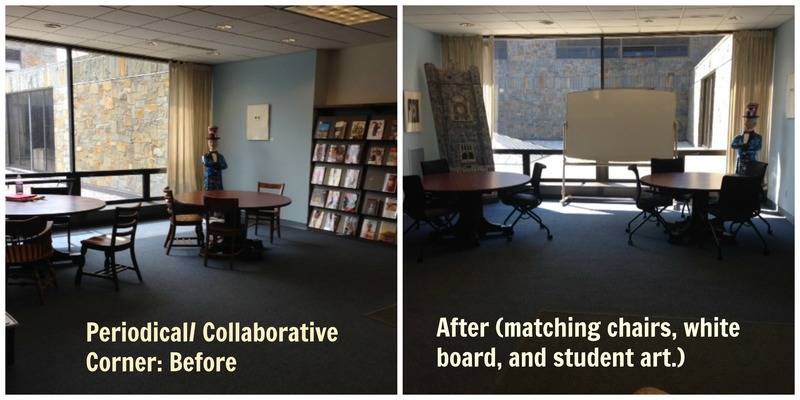 These projects do add up, but if your space is as dated as mine and if your goal is to add features that aren’t readily available in other study centers around campus, maybe you will consider adding one or two? If you’re lucky enough to have matching furniture, well then good on ya. 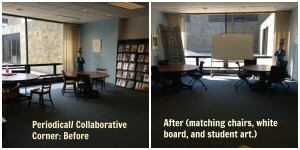 You’re already on your way to a high impact space that is not only usable, but a highlight of school tours. What other low cost, high impact, physical changes might you suggest for the rest of us? Wishing everyone an AMAZING start to your school year! Can’t wait to hear about all the cool things you have planned.